The retina is the light-sensitive layer at the back of the eye that converts light images into nerve impulses that are relayed to the brain to produce sight. When the retina separates from the deeper layers of the eyeball that normally support and nourish it, the retina is said to be detached. Without this nourishment and support, the retina does not function properly, and this can cause a variety of visual symptoms. For example, if the retina detaches near the macula, the part of the eye that is responsible for the center of the visual field (reading for instance), then there may be a sudden, significant blurring or loss of vision. However, if the area of detachment is closer to the outer edges of the retina, then the visual loss may be more like a curtain being drawn over one side of the visual field (the "curtain effect"). Other symptoms of retinal detachment may include floating shapes in the field of vision or brief flashes of light. Although there are several types of retinal detachment, the most common one starts when a tear or hole develops in the retina, and some of the gel-like substance that fills the inside of the eye (vitreous fluid) leaks through the opening. 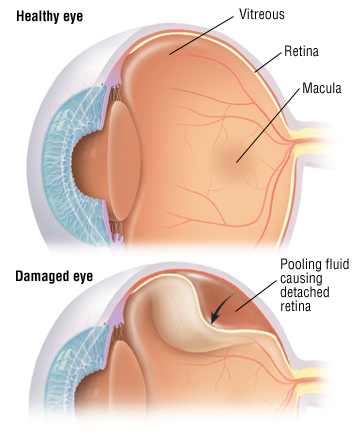 Eventually, the leaking vitreous fluid gets behind the retina, separating the retina from other layers of the eye.